Megan and Ray Andrew’s holiday themed home located on 784 Chestnut Street in Middleport. Marjorie and John Blake’s wreath clad home located on 424 South Second Avenue in Middleport. Henry Clatworthy, a long time Middleport resident, in front of his festive home located on 764 South Third Avenue. 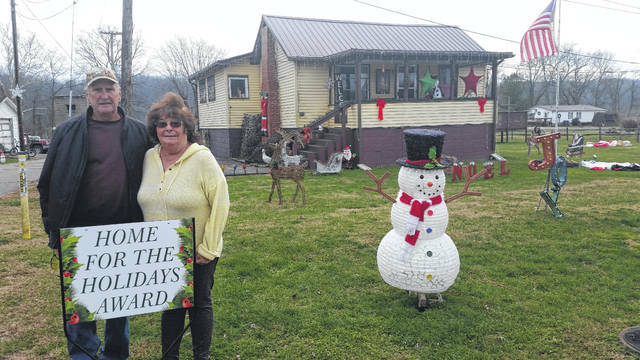 Larry and Fona Smith in front of their home’s Christmas display in Middleport. Jim and Janice Warner at their festively decorated home on 752 South Second Avenue in Middleport. 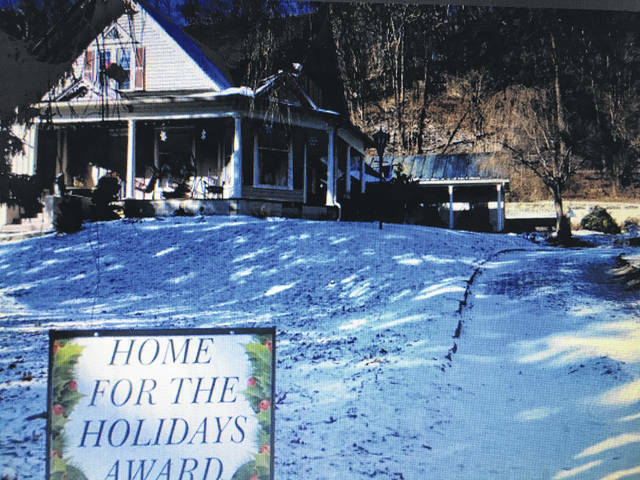 MIDDLEPORT — During the month of December anonymous judges took in the festively decorated homes throughout the the village of Middleport and selected five winners for a holiday contest. 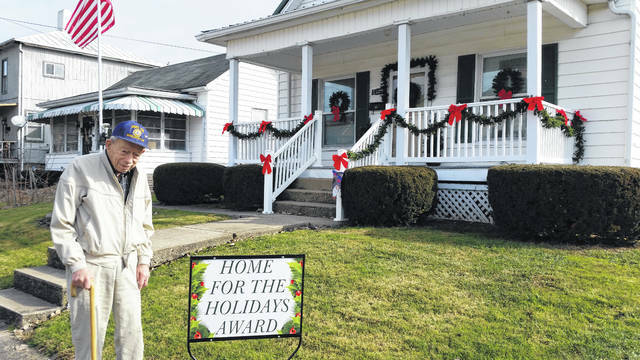 Building Inspector Mike Hendrickson said the Home for the Holidays contest started at the beginning of December and lasted for five weeks ending on Jan. 2. Hendrickson expressed that during these weeks one winner was chosen each week by anonymously selected judges who were not from the village as to make the contest as unbiased as possible. He aided in the contest by visiting each winning home, taking the homeowners’ photo, and getting a comment from the homeowners so to be shared with the community. Hendrickson said this was the first year the village held a holiday contest such as this, but they would like to continue this for years to come because the community received it very well and most importantly the community was excited to participate. “I think it will be infectious,” said Hendrickson. He expressed that he feels this holiday contest could potentially spread throughout many other local communities because of the way the Middleport Village responded. Hendrickson shared that the winners of the contest were proud of their homes and were excited to have them showcased. He added how glad he was the contest received only positive feedback through online media sources as well. “Middleport is a nice small community and it is getting better,” said Hendrickson. Hendrickson shared that with being the building inspector for nine years, he was plagued with primarily noticing the negative side of Middleport. However, during this contest his eyes opened to the beauty of Middleport and he noticed what nice homes are throughout the village. He added that he got to witness and feel the local pride from the people who decorated their homes. 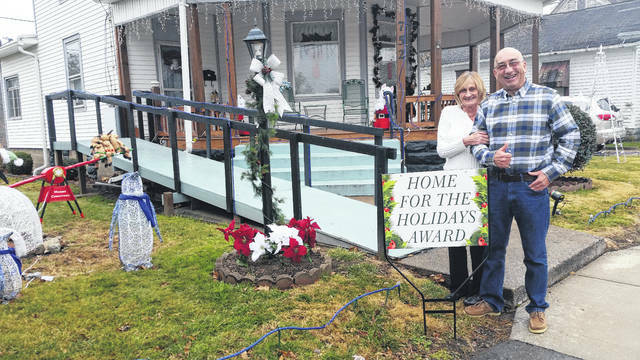 Hendrickson shared that the first home he visited with Mayor Sandy Iannarelli to present the Home for Holiday’s Award belonged to Henry Clatworthy. He said that Clatworthy told them one his displays in his side yard, a Santa with his reindeer, was painted by him and his late wife. Hendrickson said that Clatworthy displays this every year for the community. Clatworthy shared with Hendrickson and Iannerelli that he has lived in Middleport all of his life. The second home Hendrickson and Iannarelli visited belonged to Larry Smith and Fona Smith. Hendrickson shared that the couple expressed their love for decorating during the holidays and that they have been decorating their home for many years. He added that the display in their yard was the most spectacular during night time hours when it was lit. Hendrickson said people can tell this couple spent several hours putting up their decorations for the holiday season. The third home Hendrickson and Iannarelli visited belonged to Jim Warner and Janice Warner. Hendrickson shared that the couple has always decorated their home for the holiday season, but this year he noticed many new displays in their yard. Jim Warner told Hendrickson that their decorations will take a total of 4 days to be taken down, checked out, and then stored away. The fourth home Hendrickson and Iannarelli visited belonged to Megan Andrews and Ray Andrews. Hendrickson shared the house is located up a long driveway and can still be seen throughout the village at night. He added that the Andrews’ home is always nicely decorated during the holiday season. The fifth home Hendrickson and Iannarelli visited belonged to Marjorie Blake and John Blake. Hendrickson said the Blake’s display helped lift the community’s Christmas spirit and brought cheer to the holiday season. He expressed the home was festively decorated with pine wreaths, red bows, and standing figures. Hendrickson shared how glad he was to be involved with this contest and believes in years to come the contest will gain popularity and more residents’ homes will be decorated during the holiday season to delight in this festive competition. 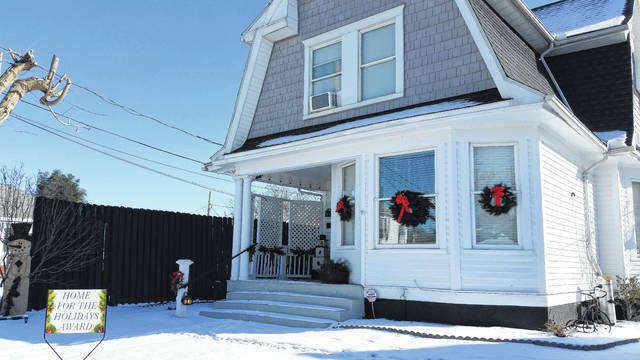 https://www.mydailytribune.com/wp-content/uploads/sites/42/2018/01/web1_0106.ANDREW.jpgMegan and Ray Andrew’s holiday themed home located on 784 Chestnut Street in Middleport. https://www.mydailytribune.com/wp-content/uploads/sites/42/2018/01/web1_Blake.jpgMarjorie and John Blake’s wreath clad home located on 424 South Second Avenue in Middleport. https://www.mydailytribune.com/wp-content/uploads/sites/42/2018/01/web1_Clatworthy.jpgHenry Clatworthy, a long time Middleport resident, in front of his festive home located on 764 South Third Avenue. https://www.mydailytribune.com/wp-content/uploads/sites/42/2018/01/web1_Smiths.jpgLarry and Fona Smith in front of their home’s Christmas display in Middleport. https://www.mydailytribune.com/wp-content/uploads/sites/42/2018/01/web1_Warner.jpgJim and Janice Warner at their festively decorated home on 752 South Second Avenue in Middleport.